29mm titanium and ceramic case, solid back, screw-down crown, titanium bezel, highly scratch-resistant crystal, silver gray dial with 8 diamond indicators, high-precision quartz movement with hours, minutes, seconds, ceramic bracelet, triple-folding buckle in steel. Water resistant to 50 meters. 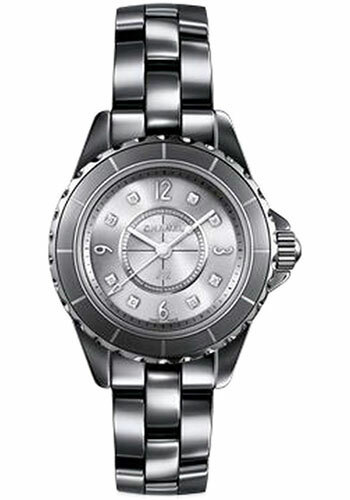 29mm titanium and ceramic case, solid back, titanium bezel set with 40 diamonds (~ 0.9 carat), highly scratch-resistant crystal, silver grey dial with 8 diamond indicators, high-precision quartz movement with hours, minutes, seconds, ceramic bracelet, triple-folding buckle in steel. Water resistant to 50 meters. 29mm titanium and ceramic case, solid back, titanium bezel set with 328 diamonds (~ 2.59 carats), highly scratch-resistant crystal, silver gray dial with 8 diamond indicators, high-precision quartz movement with hours, minutes, seconds, ceramic bracelet, triple-folding buckle in steel. Water resistant to 50 meters.